In version 0.9.5, a new feature has been added to make it easier to copy and paste usernames and passwords. Select user name or password while in you are in the web browser application to quickly copy and paste both of them without switching back and forth. These options will disappear when you close the entry or when the database times out. UI tweaks thanks to Francis Jacquerye. Also, I fixed the way that the Go to URL function worked. It now assumes http if no protocol is specified and gives an error message instead of crashing if there is no app installed to handle the URL. Thanks Kevin Backs for helping me track down the problems. Quick update to add some textbox hints and to address some issues with non-ascii characters in passwords. Search is now available from any group activity. Currently search is looking at the title, url, and comment field. It's a little naive at the moment. I'm open to suggestions for improving it. No more crashing if you open the keyboard or change orientation during database loads and saves. New version is released. The major improvement is that this version supports editing existing KeePass entries. v.0.1.2 is up. Fixes crashes when accessing any root level group other than the first. 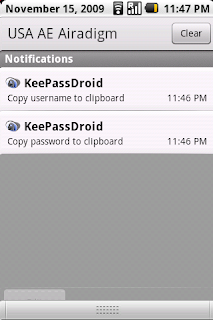 KeePassDroid 0.1.1 is out. I'll be putting this version up on the Market. 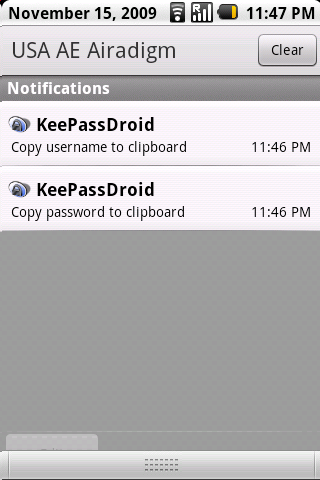 The first public release of KeePassDroid is now avaible on the Google Code page. Currently, this application supports basic reading of KeePass databases. Editing databases is not yet supported.